Lift and tighten face skin without surgery. Great for abdomen and arms as well. Loose sagging skin can now be corrected with the Profound ® skin tightening system. 100% of people see results from Profound and they get 20-50% of face lift tightening. The treatment causes collagen, elastin and hyaluronic acid to grow in the dermis, reversing the natural aging process. Reduce wrinkles, loose skin, signs of aging with Profound non-surgical face lift treatment. See Dr. Michael Bailey, Cosmetic Surgeon, in our building for a traditional face lift. Serving Boise Meridian Eagle Sun Valley Southeast Downtown Idaho, Spa Thirty Five. Please note that results vary by individual. Your genetics, overall health and lifestyle choices (e.g. sun exposure, diet) all influence your results. Are you thinking about a facelift, or trying to extend the effectiveness of your facelift? Now you have a solution that works 100% of the time with one treatment! Profound System from Syneron-Candela is a unique procedure that produces predicable, dramatic, visible changes in skin laxity without surgery. After one treatment your skin rebuilds collagen, elastin and hyaluronic acid to recreate the volume and structure you had at a younger age. This increase in skin tone and volume lifts and tightens your skin and decreases the amount of loose lax skin in the lower face and jawline. Profound is a unique treatment that uses energized micro-needles combined with epidermal cooling to deliver high amounts of precisely controlled energy to the dermis while protecting the surface of the skin. The aging process, both genetic and environmental (such as that from the sun) decrease the thickness of your collagen, decreases the amount of hyaluronic acid and weakens the tightening power of your elastin. The Profound system delivers computer controlled radio-frequency energy into these skin structures resulting in their rapid regrowth to younger volumes and function so you can look years younger. Common treatment areas for the Profound non-surgical face lifting are the jaw/jowl, cheeks and neck. The Profound can also be used on the body as well as the face. Common body areas treated include knees, arms and abdomen. Clinical studies have shown that 100% of people see changes in their skin and 95% see an improvement in skin laxity. These figures are much higher that competing treatments, who have a large percent of patients that are “non-responders”. This creates a competitive advantage for Profound because the results are consistent and noticeable. The treatment takes about an hour and one half. The treatment area is numbed with a topical and then an injected numbing agent. Then the Profound hand piece is placed on the skin and it’s six pair of microneedles penetrate the skin and delivered controlled energy for approximately 4 seconds. The hand piece is moved to a new position and the process continues until the entire treatment area is covered. Immediately after the treatment there can be some pin point bleeding and bruising. The recovery process is very tolerable. You can typically return to a normal schedule 3-5 days after the Profound non-surgical face lift. ** Results vary. Non surgical devices have proven themselves to be largely ineffective with minimal to no long term results. The Profound System now offers a real solution. This works by injecting bipolar energy directly under the skin to obtain stimulation and results unattainable by other devices. It will take about three months for your full results to be visible. The degree of tightening and lifting varies by patient based upon the current level of collagen shrinkage and elastin damage. But experience has shown very high levels of patient satisfaction, with tightening of 20-50% of surgical procedures. Profound results are maximized when combined with fractional resurfacing, IPL and hyaluronic fillers such as Juvederm. Results last several years. A common way to think about the Profound treatment is that it rolls back the aging timeline, returning your skin to it previous condition from your younger years with new collagen, elastin and hyaluronic acid. Then, the aging process begins again from your new skin set point. Older skin that has less regeneration ability will have lower levels of response from the Profound. Keep in mind that your lifestyle decisions will impact the success and longevity of your results. Habits such as sun avoidance, diet, exercise and smoking all impact the health of your skin and its ability to build and maintain key structures. ** Results vary. Uploaded by Syneron Candela on 2015-06-21. Periodic retreatment or synergistic treatments such as IPL will extend the effectiveness of your Profound non-surgical face lift. Why Spa 35 Med Spa is the right place for you to get your Profound non-surgical face lift? Spa 35 is the only facility in Idaho with the Profound system from Syneron-Candela. For ten years Spa 35 has been utilizing energy based devices (such as resurfacing lasers and broad spectrum light devices) with cosmetic fillers and nuero-regulators to help our clients look and feel their best. 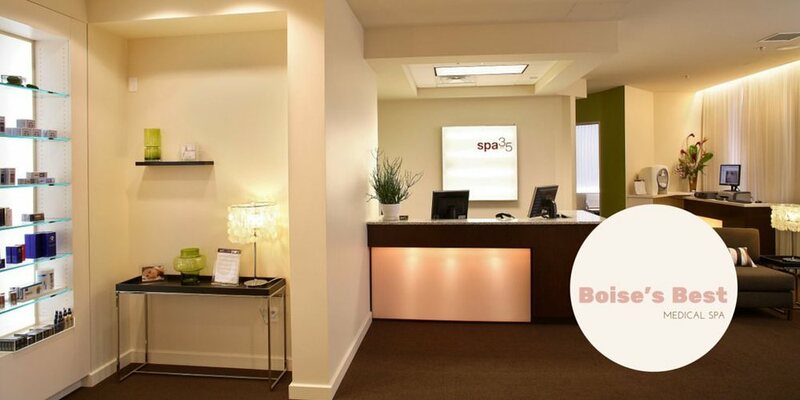 The Spa 35 team has the knowledge and experience to help you determine the best treatments for the outcomes you seek and to help you develop a comprehensive plan to maximize and extend your Profound results. Spa 35 clients have consistently reported positive experiences and outcomes from their Spa 35 procedures as shown by the large number of five star reviews on Google, YELP and Demandforce. Spa 35 has an established relationship with a co-located cosmetic surgeon, Dr. Michael Bailey. This provides our clients expansive choices in their cosmetic treatment options, including face lifts, blepharoplasty, and neck lifts. Non-surgical facelift. What does that mean and how does it compare to a traditional surgical face lift? The term “non-surgical face lift” has become very popular phrase in the aesthetics and cosmetic area. It has been used to describe a combination of dermal fillers and Botox with the phrase “liquid face lift”. A traditional face lift is composed of surgical techniques to trim off excess skin and reposition tissues and muscles of the face. In some cases it is combined with fat transfers or implants to replace facial volume lost during the aging process. Non-surgical face lift has become popular because people recognize the dramatic changes that can be achieved with a surgical face lift, but many do not want to experience the downtime and potential complications of a surgical procedure. Does Profound produce the same results as face lift? No. The Profound non-surgical face lift and a traditional surgical are two different approaches to lifting and tightening skin to return it to a more youthful state. A surgical face lift is more a mechanical method, using cutting, stapling and suturing to the skin from the underlying facia, remove the excess skin and reattach the skin, connective tissues and muscle to new positions on the face. Profound rebuilds the volume of and connective strength within the skin. An analogy would be the appearance of a helium balloon when is new to how it looks the next morning when some helium has escaped. The new balloon represents the smooth face of your youth, the wrinkled balloon represents the change in appearance that occurs as your skin thins and loses volume. Profound “replaces the helium” of your face. ** Dr. Beaty talks about the non-surgical proceedure Profound and its ability to rejuvenate, tighten, and eliminate cellulite without surgery. What does it cost? Cost vary by treatment area. Typically a face treatment is $3,499. Neck, hands, arms, abdomen and knees have varying pricing. Spa 35 is happy to provide a free consultation so you can get the appropriate pricing for your desired treatment area. Does it hurt? There is very little discomfort with the Profound treatment. The numbing process typically reduces any sensation to slight tugging or pulling of the skin. ** Results vary. Dr. Alexiades-Armenakas provides a detailed interview on the Profound system, Profound is a single treatment that creates elastin, collagen and hyaluronic acid - building blocks to keep your skin smooth and elastic. She provides insight on her personal experience which includes clinical studies on the system. ** Results vary. Profound by Syneron Candela. A non-surgical, 45 minute in-office treatment that dramatically improves aging skin to make you look years younger. Profound can add volume to cheeks, reduce marionette lines, add structure to neck, tone jawline laxity and smooth nasolabial folds. Clinical Studies Supporting Profound Lift Claims of 100% Responders and Efficacy. Dermatol Surg. 2015 May;41(5):623-32. doi: 10.1097/DSS.0000000000000347. Randomized, blinded, 3-arm clinical trial assessing optimal temperature and duration for treatment with minimally invasive fractional radiofrequency. *Department of Dermatology, Yale University School of Medicine, New Haven, Connecticut; †Dermatology and Laser Surgery Center, New York, New York; ‡Syneron Medical, Inc., Milpitas, California. A previous multicenter clinical trial of a needle-based fractional radiofrequency (FRF) treatment for facial and neck rhytides and laxity counterintuitively demonstrated a mean target temperature and treatment duration of 69.5 °C and 4.9 seconds for subjects with lesser improvement and 67 °C and 4.2 seconds for greater improvement. To determine optimal temperature and duration settings for maximal clinical results in rhytides and laxity from a single FRF treatment of the face and neck. A randomized, blinded, 3-arm clinical evaluation of FRF at a series of temperatures from 52-57 °C to 67 °C. Three blinded plastic surgeons and dermatologists scored rhytides using the Fitzpatrick Wrinkle Assessment Scale and laxity using the Alexiades Laxity Assessment Scale at 1, 3, and 6 months. Blinded grading showed optimal improvement at 67 °C and 3 seconds and decreased efficacy below 67 °C, with mean rhytide reductions of 40, 29, and 25% and mean laxity reductions of 34, 36, and 25% in Arms 3 (67 °C), 2 (62 °C), and 1 (52 °C-57 °C), respectively. A 100% response rate was observed for all subjects treated at 62 °C to 67 °C target temperature. The optimal target dermal temperature for facial and neck rhytide and laxity treatment is 67 °C and duration of 3 to 4 seconds with a 100% response rate after a single FRF treatment. Dermatol Surg. 2013 Feb;39(2):263-73. doi: 10.1111/dsu.12065. Epub 2012 Dec 28. Prospective multicenter clinical trial of a minimally invasive temperature-controlled bipolar fractional radiofrequency system for rhytid and laxity treatment. Alexiades-Armenakas M1, Newman J, Willey A, Kilmer S, Goldberg D, Garden J, Berman D, Stridde B, Renton B, Berube D, Hantash BM. A minimally invasive fractional bipolar radiofrequency (FRF) was developed. To evaluate safety and efficacy of FRF in reducing face and neck rhytides and laxity. This prospective, open-label, multicenter clinical trial enrolled 100 subjects with mild to severe facial and neck rhytides and laxity at seven centers in a per-protocol analysis. One single-pass FRF treatment was administered through five 32 g-needle electrode pairs at a preselected real-time fixed temperature of 62 to 78°C, energy duration for 3 to 5 seconds, and impedance restrictions of 200 to 3,000 Ohms, ensuring intradermal delivery. Five blinded dermatologists and plastic surgeons graded randomized standardized baseline and follow-up photographs of 53 and 42 subjects at 3- and 6-month follow-up intervals, respectively, using the Fitzpatrick wrinkle and Alexiades-Armenakas laxity scales. Subject assessments and adverse events were recorded in 100 subjects. Blinded evaluations revealed correct pre- and post-treatment identification in 100% of scored cases, mean improvement of 25.6% on the Fitzpatrick Wrinkle Scale and 24.1% on the Alexiades-Armenakas laxity scale at 6 months, and 100% response rate for rhytides and 95% for laxity. Subgroup analysis revealed maximal rhytid reduction in the mean target temperature of 66.7, energy duration of 4.2 seconds, and volume of denatured collagen of mm(3) denatured collagen group. Adverse events included transient erythema, edema, and ecchymoses, resolving within 1 to 5 days, and two incidents of temporary pinpoint depressions. More than 90% of subjects were satisfied or very satisfied. Real-time temperature-controlled FRF is a highly reproducible, safe, effective nonsurgical treatment of face and neck rhytides and laxity and provides important insights into neocollagenesis, neoelastogenesis, and clinical outcomes. Dermatol Surg. 2010 Jun;36(6):877-84. doi: 10.1111/j.1524-4725.2010.01563.x. Elastometry and clinical results after bipolar radiofrequency treatment of skin. Willey A1, Kilmer S, Newman J, Renton B, Hantash BM, Krishna S, McGill S, Bérubé D.
Dermatol Surg. 2011 Dec;37(12):1821. Hantash, Basil [corrected to Hantash, Basil M]. The healing process of a novel radiofrequency bipolar system was recently shown to produce a profound increase in collagen and elastin content. To determine the relationship between subjective clinical improvement scores and changes in objective measures of mechanical skin properties. Elastometry measurements were made at baseline and 3 months after treatment. All patients received a treatment zone on the lower face. Patient assessments of results and physician ratings of wrinkle and skin laxity were collected at baseline and 3 and 6 months after treatment. Elastometry and clinical results were then compared. Three months after treatment, elastometry measurements showed statistically significant improvement (5-12% decrease in Young's Modulus and 10-16% decrease in retraction time). The average improvement correlated to a 2.6-year improvement in skin property. Physician scores at 3 months showed a statistically significant improvement of 1.42 grades on the Fitzpatrick scale for wrinkles and 0.66 grades on the Alexiades scale for skin laxity, increasing to 1.57 and 0.70 improvement, respectively, at 6 months. Eighty-nine percent and 91% of patients were satisfied or very satisfied with the procedure at 3- and 6-month follow-up, respectively. Elastometry data showed an average decrease in Young's Modulus and retraction time, both of which suggest that radiofrequency bipolar treatment resulted in more youthful skin. Better mechanical characteristics were consistent with improvements in wrinkles, laxity, and skin quality and appearance. Arch Dermatol. 2010 Apr;146(4):396-405. doi: 10.1001/archdermatol.2010.24. Blinded, randomized, quantitative grading comparison of minimally invasive, fractional radiofrequency and surgical face-lift to treat skin laxity. Alexiades-Armenakas M1, Rosenberg D, Renton B, Dover J, Arndt K.
To quantify the improvements in laxity from the surgical face-lift and to perform a randomized, blinded comparison with the clinical effects of a novel, minimally invasive fractional radiofrequency (FRF) system. Fifteen sequential patients with facial skin laxity enrolled in the trial and completed FRF treatment and follow-up. Baseline and follow-up digital photographs of patients undergoing FRF were randomly mixed with 6 sets of baseline and follow-up images of patients undergoing surgical face-lift with equivalent baseline facial laxity grades. Five independent blinded evaluators graded randomized baseline and 3- to 6-month follow-up photographs using a comprehensive quantitative 4-point laxity grading scale. Quantitative changes in laxity grades were calculated and compared statistically for FRF treatment vs surgical face-lifts. Patient satisfaction and adverse events were also evaluated. Blinded grading of unmarked, randomized baseline and follow-up photographs of patients undergoing FRF treatment randomized with baseline and follow-up photographs of patients undergoing surgical face-lift demonstrated statistically significant improvement in facial laxity, with a mean grade improvement of 1.20 for patients in the surgical face-lift group and of 0.44 for FRF-treated patients on a 4-point laxity grading scale (P < .001). The improvements relative to baseline were 16% for FRF treatment compared with 49% for the surgical face-lift. The mean laxity improvement from a single FRF treatment was 37% that of the surgical face-lift. Patient satisfaction was high (dissatisfied, 0%; neutral, 7%; satisfied, 60%; and very satisfied, 33%). All participants in the FRF treatment group experienced transient erythema, mild edema, and mild to moderate purpura that resolved in 5 to 10 days, and they returned to normal activities within 24 hours. There were no adverse events or complications in the FRF group. All patients in the surgical face-lift group experienced scarring at surgical margins, erythema, edema, and ecchymosis, and they returned to normal activities on suture removal at 7 to 10 days. This randomized, blinded, quantitative assessment using a validated grading scale of skin laxity improvement from the gold standard treatment, the surgical face-lift, and comparative analysis to a novel, minimally invasive FRF treatment has demonstrated 49% improvement in skin laxity relative to baseline for the surgical face-lift, compared with 16% for FRF. The surgical face-lift resulted in a mean 1.20-grade improvement on the 4-point laxity grading scale. In comparison, a single, minimally invasive FRF treatment demonstrated a 0.44-laxity grade improvement, or 37% that of the surgical face-lift, without the adverse effects and complications of surgical procedures. This study provides a basis for quantifying cosmetic outcomes from novel treatments with comparative analysis to the gold standard. It also suggests that minimally invasive FRF treatment may provide an important nonsurgical option for the treatment of facial skin laxity. Dermatol Surg. 2012 Nov;38(11):1765-76. doi: 10.1111/j.1524-4725.2012.02547.x. Epub 2012 Aug 22. Radiofrequency in cosmetic dermatology: a review. University of Medicine and Dentistry of New Jersey, Newark, NJ, USA. Fine lines and rhytides are clinically evident signs of photodamage. Traditionally, ablative and nonablative lasers have been used for nonsurgical facial rejuvenation, but their side effects and downtime have limited their use. Radiofrequency (RF) is novel nonablative technology originally used to target photodamage. It differs from lasers in that it uses an electric current rather than a light source. It is frequently used in dermatology to treat skin laxity, rhytides, acne vulgaris and scarring, and cellulite. The goal of this review is to summarize the various types of RF devices and their uses and to determine the evidence-based efficacy of these devices. This article reviews the current literature on RF, its uses and clinical effectiveness, and a practical guide for application of the assorted RF devices. Results have been favorable for the different clinical uses of RF, but many studies are nonrandomized, noncomparative trials that use subjective means of evaluation. Overall, nonablative RF is a safe, tolerable, and effective tool for skin rejuvenation and cellulite treatment that produces modest results. RF should serve as an alternative but not as an equivalent substitute to surgery. Lasers Surg Med. 2009 Sep;41(7):473-8. doi: 10.1002/lsm.20794. A predictive model of minimally invasive bipolar fractional radiofrequency skin treatment. Berube D1, Renton B, Hantash BM. A novel bipolar fractional radiofrequency (FRF) system with temperature feedback was recently developed for facial laxity and rhytid treatment. The study objective was to develop a model based on published in vivo human skin data that could be extrapolated to aid physicians in making future dosimetry choices under clinically relevant conditions. A standard electrode pair designed for use with the FRF system was modeled using finite element analysis (FEA). The model incorporated temperature feedback from sensors within the electrodes, selectable target dermal temperatures, and an epidermal cooling plate. The model was validated using data obtained during clinical treatments. Thermal injury as a function of target temperatures and electrical conductivity was simulated and then validated using in vivo histology results. Lesion size predicted by the model matched histology samples. Lesion width and height were 1.65 and 1.24 mm compared to 1.75 and 1.21 mm for the model versus in vivo, respectively. The thermal profile remained confined between the proximal and distal ends of the electrodes. Ninety-six percent of power was deposited in the dermis. Dose-response curves showed a nonlinear volume increase to 1.7 and 4.7 mm(3) at target temperatures of 65 and 75 degrees C, respectively, and a low sensitivity to electrical conductivity variation. FEA of the Bipolar FRF system revealed that isotherms were mainly within the dermis. Lesion volume was found to be less sensitive to changes in electrical conductivity than to target temperature and duration. Simulation results matched well the in vivo lesion dimensions. To our knowledge, this is the first model of bipolar FRF treatment capable of accurately predicting the thermal response of human skin in vivo. The findings of this study allow for the development of accurate dose-response curves to aid physicians in parameter selection and achieving efficacy and safety profiles. Lasers Surg Med. 2009 Feb;41(2):87-95. doi: 10.1002/lsm.20687. Pilot clinical study of a novel minimally invasive bipolar microneedle radiofrequency device. Hantash BM1, Renton B, Berkowitz RL, Stridde BC, Newman J.
Stanford University School of Medicine, Stanford, California, USA. Noninvasive bipolar and monopolar radiofrequency (RF) deep dermal heating devices have previously been described. A novel minimally invasive RF device employing a bipolar microneedle electrode system is introduced and its resultant thermal effects on human skin in vivo were characterized for the first time. An investigational 35 W RF device was configured to operate in bipolar mode delivering energy directly within the dermis using 5 microneedle electrode pairs with real-time feedback of tissue temperature for treatment control. Superficial cooling was achieved using a Peltier device. A range of pulse durations between 1 and 25 seconds, and lesion temperatures between 60 and 80 degrees C were tested in vivo on 15 human subjects. Thermal effects were assessed histologically using either hematoxylin & eosin (H&E) or nitroblue-tetrazoliumchloride (NBTC) staining. Treatment effects and adverse events were also monitored clinically. The investigational bipolar RF device delivered controlled heating within dermal tissue. Histological staining with H&E revealed the presence of zones of denatured collagen within the reticular dermis. Lesions were generated at preselected temperatures between 60 and 80 degrees C. Fractional lesions separated by zones of sparing as well as contiguous lesion patterns were demonstrated. Histological staining with H&E and NBTC revealed sparing of adnexal structures and adipose tissue. No major adverse events were observed. A novel fractional RF device utilizing a minimally invasive bipolar microneedle delivery system for the treatment of human tissue was developed. Treatment of 15 human subjects illustrated the controlled creation of dermally located thermal coagulation zones, herein known as radiofrequency thermal zones. We discovered that varying the pulse length allowed for fractional sparing of dermal tissue. To our knowledge, this is the first report to describe use of a direct real-time temperature and impedance feedback system to control energy delivery during deep dermal heating. Lasers Surg Med. 2009 Jan;41(1):1-9. doi: 10.1002/lsm.20731. Bipolar fractional radiofrequency treatment induces neoelastogenesis and neocollagenesis. Hantash BM1, Ubeid AA, Chang H, Kafi R, Renton B. We recently introduced Renesis, a novel minimally invasive radiofrequency (RF) device, for the treatment of human skin. The wound healing response post-fractional RF (FRF) treatment was examined in human subjects. The FRF system delivered RF energy directly within the dermis via 5 micro-needle electrode pairs. Tissue temperature was held at 72 degrees C for 4 seconds using an intelligent feedback system. The wound healing response was evaluated histologically and by RT-PCR up to 10 weeks post-RF treatment. Neoelastogenesis and the role of heat shock proteins (HSPs) were assessed by immunohistochemistry. FRF treatment generated a RF thermal zone (RFTZ) pattern in the reticular dermis that consisted of zones of denatured collagen separated by zones of spared dermis. RFTZs were observed through day 28 post-treatment but were replaced by new dermal tissue by 10 weeks. HSP72 expression rapidly diminished after day 2 while HSP47 expression increased progressively through 10 weeks. Reticular dermal volume, cellularity, hyaluronic acid, and elastin content increased. RT-PCR studies revealed an immediate increase in IL-1beta, TNF-alpha, and MMP-13 while MMP-1, HSP72, HSP47, and TGF-beta levels increased by 2 days. We also observed a marked induction of tropoelastin, fibrillin, as well as procollagens 1 and 3 by 28 days post-treatment. Our study revealed a vigorous wound healing response is initiated post-treatment, with progressive increase in inflammatory cell infiltration from day 2 through 10 weeks. An active dermal remodeling process driven by the collagen chaperone HSP47 led to complete replacement of RFTZs with new collagen by 10 weeks post-treatment. Furthermore, using both immunohistochemical and PCR studies, we successfully demonstrated for the first time evidence of profound neoelastogenesis following RF treatment of human skin. The combination of neoelastogenesis and neocollagenesis induced by treatment with the FRF system may provide a reliable treatment option for skin laxity and/or rhytids.